It looks like my body has recuperated from all the pulls and tears that I have inflicted upon myself over the last few months. 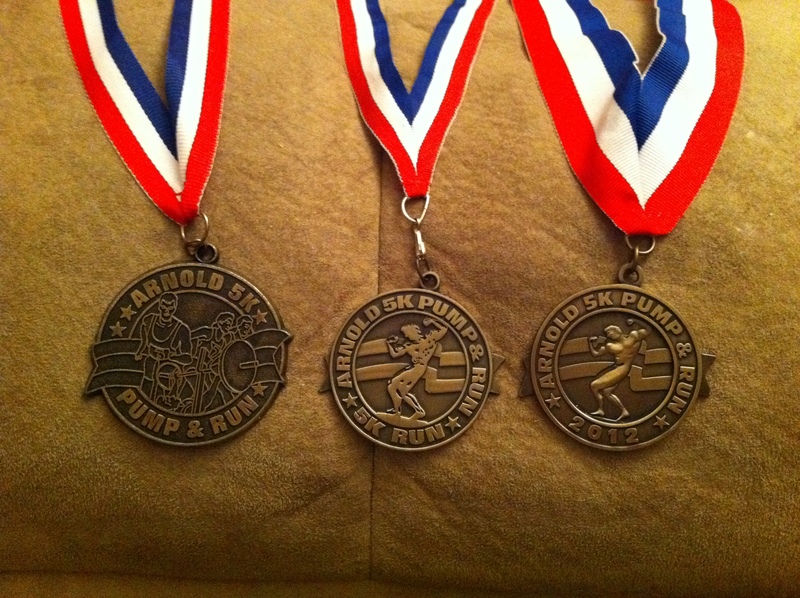 I was able to participate in the Arnold’s Classic Pump and Run (ran a 32 min 5k race and bench pressed 100 lbs 6 times) last week. It wasn’t my best result, but I was glad to have been able to participate. I am looking forward to my 4th P&R medal next year! My running game plan was to run 8 miles yesterday after we finished working on the Habitat for Humanity project. But after 7 hours of manual labor, we didn’t get home until 5:30pm and it was too late for me to get ready to run a long run. That was OK, because my body felt very beat up. The new game plan was to run 8 miles early today. Amazingly, the 8 turned into 10! It was slow, keeping my HR between 70 & 75 percent, but my body felt really good afterwards. Tired, but good. Next Saturday or Sunday I am shooting for 12 miles. So, now I am toying with the idea of running a half marathon April 1st…. 20 miles this week! I hope I can keep that up. Good week last week. Ran 20 miles total, which I haven’t done in a while. Found a new route to run. The route is not new, just new to me. It is pretty hilly, but in the end it will make me a stronger runner. The achilles tendon in my left heel is aching quite a bit. It is bearable, I can only hope it doesn’t get too be too bad. Comments Off on 20 miles this week! I hope I can keep that up. Last week had its ups and downs. My treadmill mileage wasn’t what I hoped it would be. On the 19th my body told me it didn’t want to run on the treadmill further than 2 miles. The 8 miler on Saturday went really well though, perhaps because I took Friday off, so to speak. My sister ran with me and it was great having her there. The night before the race was a restless one. You know, where you toss and turn and look at the clock to see how many more hours you get to sleep. The night didn’t start with many hours to go to begin with. I believe when I headed to bed I had 5 hours and 44 minutes before getting up at 4:15 a.m. At some point in the night I turned the clock away from me! At 4:15, when the alarm went off, I was in a dead sleep, of course! lol So, I just rolled out of bed. Got dressed, ate, and headed to a A’s house to head up together with her and T.
We got to Cbus in plenty of time and cought an early bus to the starting line. (Straight course, so you had the option to bus to the starting line before or after the race, depending on where parked your car). On the way up we saw the course being set up for the race. Once we got to the starting area the waiting began. We met up with other MiTers and hung out, after the tratitional potty stop, until the race started. We watched the elite runners ditch the line and just take a potty where the door just opened up, leaving the poor person that was waiting in line to have to take the next one. Not very sportsman like I must say! It’s a go: A and I headed towards the starting line and I was still on the fence on how to run this race. I decided to hang with A for a while. She was running a relay and her partner (another) T was jumping in at mile 3.We chatted and had fun and T jumped in just before mile 3. After mile 4 I left them. I felt good and their pace was a bit to slow for me. Their race wasn’t until next weekend, so they were running comfortably. Waterstops: The course layout showed water stops at every mile between mile 2 and 12. The first water stop, after mile three was poorly set up, it was almost like a “serve yourself station”. At mile four they had run out of water completely and the same held true for mile 5. I was bumming. I didn’t get much water at the first stop. To the rescue: The other T’s husband cought me (via car) around mile 7 or 8 and gave me a bottle of gatorade. Yes! I didn’t have to rely on waterstops and their HEED (there wasn’t any Gatorade along the course), but the bottle was a bit heavy in the beginning. In the past during mile 9 through 13.1 I end up walking more and more, but this time around I talked myself into running a mile at a time and just taking a short walk break when getting to the mile marker. What really helped was that the course is slightly down hill after mile 9 and we had a slight tailwind. The Finish: The last half mile I ‘clamped’ myself behind a MiT runner (she didn’t know I was there) that had helped me in my 2007 marathon race and I let her pull me down the road (so to speak). After: I had to stand in line to get my medal, hat, and towel. That is not fun after you have run for 2 plus hours. Everything hurts and you don’t just want to be standing in line. But, about 10 minutes I got my stuff and headed back to the MiT tent. Then we headed to lunch….yummy. The next day: I am sore today (Monday), but I am also feeling good about my accomplishment. 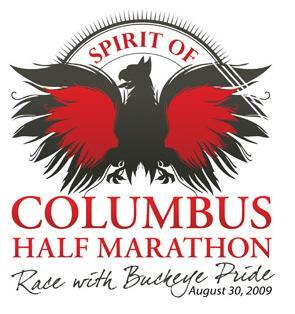 I am looking forward to running the Columbus Marathon (half) in October to see if I can get a PR. Overall: The weather was great. One could not ask for a better day to run. The course was great, mostly down hill. The water stops need to be changed, but at least all the kids where cheering the runners on. I am sure that next year the race will be handled better, after all this is just their second year doing this. 8/18 – Horrible 4 miler @ home. Very humid and I had too much sodium during the day, making may calves swollen. That made running very tough. 8/19 – Ran 4 miles at work without my Garmin (forgot it at home). Not a bad run, but humid and raining at the end. 8/20 – Ran 4 miles at work and then 4 miles at home. The run at home was a minute faster than at work, but it was also a little cooler. 8/21 – 3.1 miles at work. Horrible run. Had donut and cappucino beforehand and ‘crashed’ during the run. After mile 1 I was done. Ran 4 miles at home in the PM and had a much better time. I felt strong. 8/22 – Walked three miles with the husband for the American Heart Association (Heart Walk). Ran a total of 9.5 miles in the PM. Ran with the intention to run 8, which I did and then tagged another 1.5 on there (in order to get home). Ran the 8 miles in my 2nd fastest time ever. Weather was great, that helped! Ran the 1.5 slowly. Notes: I ran 32.6 miles this week, plus fast walked three. That’s my highest weekly mileage in a very long time. My body is ready for the Spirit of Columbus 1/2 marathon next Sunday. I am running that one not to PR, but just to learn what I can do better for the Columbus Marathon (Half) in October. I looked at last year’s numbers, I am a little ahead of my training from last year and should do well in October. I would like to get one 15 miler in there somewhere. It would give me a peace of mind. I worked hard on my weight loss this week and all the extra PM running has paid off. However I noticed that my fat percentage is not going down quite as fast. So next week I will HAVE to hit the weights at least twice! Weightloss since 6/22: 17.5 lbs, 9.5 lbs to go!!! 7/13 – Ran 4 miles @ work. Ran all 4 miles! 7/19 – 5 milers @ home, kids followed me on their bikes…that was fun. 2 minutes faster than 7/16! Notes: I had a good running week. 25 miles all together and the need to go out and run is still there! I did upper body workout twice. Hopefully I’ll be able to do that next week again. I would like to run 15 miles next Saturday, but the hubby wants to go quadding, so we’ll see how that works out. Lost 1.5 lbs…back on track! Had my scheduled “pig out day” for the month on the 18th. I had Peanut M&Ms, some chips, 1/2 donut, and a small french vanilla cappuccino. I enjoyed everything, but felt sluggish after the M&Ms. Now I am back on track and eating healthy. Overall weight loss since 6/22, 8 lbs and 19 to go. Notes: 24 miles of running this week. That hasn’t happened in a long time. I’ll have to make sure I give my body time to rest next week. My long run was very slow almost 12 min/mile, but I enjoyed it. The 5 miler on Thursday evening was an inpromptu run and I enjoyed it also. I stopped pushing myself too hard during those runs. I am learning to only push myself during interval runs and on the elliptical rider. It is helping me enjoy the long miles. Father in-law update: The husband, mother in-law and I accompanied Roger to his last chemotherapy on Monday. He’s endured 12 of them. The 11th one hit him very hard and he was dreading the last one. I am glad that this is over and we can only hope that it killed all of his cancer. He will have a PET scan next month which will let him know if the chemo did what it was supposed do. I am running around with my fingers crossed. I gained one pound!!! I am not sure how that is possible with all the working out I did. My calorie intake is set just under 1800 cal/day and if I work out then I can add those to my intake and still should loose about a pound per week. I consumed almost 4000 calories less than I was allotted. Practially I should have lost 2 lbs this week. This is very dissapointing. My clothes are looser than they were when I started three weekes ago, but I don’t think it changed any over the last week. I am going to blame it on the time of the month and move on. I will do less cardio on Tuesdays and Thursdays and work more with weights to stimulate my metabalism. Wish me luck!